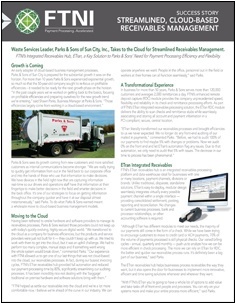 Remote Deposit Capture Streamlines Receivables Management for Parks & Sons of Sun City, Inc.
Having been tethered to onsite hardware and software providers to manage its receivables processes, Parks & Sons realized those providers could not keep up with today’s quickly evolving, highly secure, digital world. In business for more than 50 years, Parks & Sons serves more than 120,000 customers in and around the greater Phoenix valley and averages 2,000 remittances a day. FTNI’s enhanced remote deposit capture (RDC) module provides the company unprecedented speed, flexibility and reliability in its check and remittance processing efforts. As part of FTNI’s ETran integrated receivables processing solution, the ETran RDC module delivers the ability to scan checks and remittance stubs while seamlessly associating and storing all account and payment information in a PCI-compliant, secure, central location. Parks & Sons’ receivables clerks work with three separate items – coupons, checks and envelopes – for each remittance received. Previously, in addition to manually scanning and entering data associated with each coupon and payment, clerks also had to manually export batch files for input into the company’s back office AR system. With ETran now in place, the entire process is automated. Learn more by downloading the complete success story now.